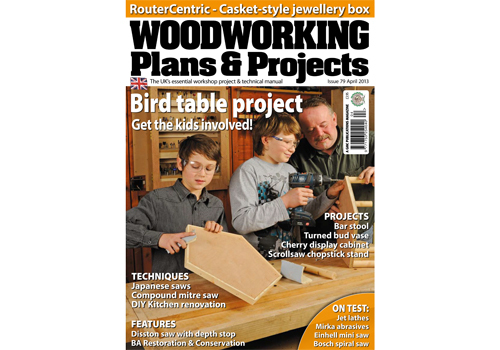 In this month's Woodworking Plans & Projects we show you how to introduce the kids to the wonders of woodworking and birdlife with a bird table project; Anthony Bailey makes a simple jewellery box in 'RouterCentric'; and Jim Robinson builds a freestanding display cabinet. Fred & Julie Byrne are at the scrollsaw once again, this time with an Eastern influence, to create a chopstick display stand; while at the lathe we have Mark Baker turning a bud vase in spalted beech. For your two-page 'Plans For You' project, Simon Rodway makes a bar stool. In techniques, Walter Hall shows you how to master yet another piece of workshop machinery, this time the compound mitre saw; James Hatter shows you how to entirely refit and update a kitchen; and The Editor takes you on a tour of Japanese saws. This monthâ€™s main feature is a student's perspective of furniture conservation and restoration, courtesy of Amber Bailey. In 'My Working Day', we catch up with WPPâ€™s technical illustrator Simon Rodway, and in 'Tools of Yesteryear', Colin Sullivan looks at a 100-year-old Disston saw. On test, we've got an Einhell mini saw, Mirka Abranet abrasives and, in 'Craftsman's Corner', Jet lathes and the Bosch tile router. If all that wasn't enough, weâ€™ve got the latest upcoming events and projects from our forum in 'Noticeboard', and 'Hot Stuff', our monthly roundup of all the latest kit and books on the market. Don't miss out! Why not download Woodworkinf Plans & Projects to your iPhone, iPad or android device and save up to 42%. Click here to find out how.